Back in our 1997/98 season, Alumnae Theatre Company staged British writer Sarah Daniels’ 1988 dramedy about the young women who worked in the bloody ‘gutting sheds’ of Victorian London, The Gut Girls. It was directed by Jane Carnwath, and performed in the intimate 3rd floor Studio space, complete with realistic pig carcasses, spewing intestines. Nineteen years later, as part of the Countdown to our 100th season – the company hits the century mark in February 2018! – we present The Gut Girls as our Retrospective Production of the 2016/17 season. This time, it will be played on the Main Stage, directed by Maya Rabinovitch, and I don’t know about the pig carcasses! Surprisingly funny and hard-hitting, this beautifully written piece follows the fortunes of the brash and proud working-class “gut girls”. When the gutting sheds are shut and their way of life disappears, the girls must try and find a place in the new world order of late Victorian London. To play multiple roles in this sharp comedy about rotting meat and workers’ rights, where Margaret Thatcher meets Victorian England. Please note: all actors must be able to perform with a formal and/or cockney British accent. The ability to sing is an asset. All interested applicants should email gutgirls.alumnaetheatre@gmail.com or leave a message on the Alumnae audition line at 416-364-4170, xtn 3. Please prepare a 2 minute monologue. You may also be asked to read from the script. All auditioners must bring a photo and résumé to the audition. Alumnae Theatre is a non-professional theatre company which encourages diversity in its membership and casting. Please note that this is a non-union and non-paying engagement. The Toronto Irish Players are holding auditions in late June for their fall production, which will be on the Main Stage of Alumnae Theatre. Outside Mullingar, described as “an Irish Moonstruck”, was nominated for Best Play at the 2014 Tony Awards. OUTSIDE MULLINGAR is a compassionate, delightful work about how it’s never too late to take a chance on love. Anthony and Rosemary are two introverted misfits straddling 40. They have spent their entire lives on cattle farms in rural Ireland. Rosemary lives right next door to Anthony and is determined to have him, while watching the years slip away. With Anthony’s father, Tony, threatening to disinherit him and, a land feud simmering between their families, and Aoife, her mother as mediator, Rosemary has every reason to fear romantic catastrophe. But then in this very Irish story with a surprising depth of poetic passion, these yearning, eccentric souls fight their way towards solid ground. Their journey is heartbreaking, funny and ultimately, deeply moving. TONY, 75 Bullying, tough-love father to Anthony. Easily provoked to anger & stubborn. Lives with a great deal of resentment and bitterness. AOIFE, 70 (Eo-fuh) Nurturing and protective mother to Rosemary and surrogate mother to Anthony. Plays the role of mediator between Anthony and Tony. ROSEMARY, 39 Anthony’s powerful, feisty neighbour with a clarity of vision. She knows what she wants but getting it is complicated. Inherited her father’s stubbornness. Determined to have Anthony, she fluctuates between despair and hope. ANTHONY, 42 Painfully shy, a joyless farmer who is torn about staying, while listening to the voice that tells him to “go.” He has stopped noticing anything outside himself and lives with the fear of rejection and failure. TO BOOK AN AUDITION – Contact Judith Levkoe at levkoejudith@sympatico.ca and indicate your preferred audition date, time and the character for whom you wish to audition. Attach your resume with contact number & a recent head shot. Alternately, call Judith at 416-214-4770 and provide the above info as well as your email address. LOCATION – Auditions and rehearsals will be held at Kimbourne Park United Church, 200 Wolverleigh Blvd, one black north of the Coxwell Subway Station exit, and east of Coxwell. PREPARATION – If the Director does not know your work, prepare a 2-minute monologue. Read the play before your audition as there will be readings from the script. SCRIPT- A copy of OUTSIDE MULLINGAR will be available upon request. PLEASE NOTE: Toronto Irish Players (TIP) is a non-profit, non-Equity community theatre group. Participants are not paid, and union members (ACTRA/Equity) cannot be used. If cast, it is required that you join the Toronto Irish Players group. Did you know that Alumnae Theatre Company, in addition to staging plays, also has a group of playwright-members – the New Play Development group (NPD) – who like to challenge themselves? The annual fall challenge is called Write Now! The writers receive a challenge theme or “ingredients” on a Friday afternoon, and have just a weekend to write their 10-minute play. Then the scripts are matched up with a pool of volunteer directors and actors, and presented as staged readings on the following Sunday. This year’s theme – devised by Annie MacMillan, who usually writes or directs – was AWAKENING. These are the plays that resulted (listed alphabetically by writer), and their directors. You can see the short plays (max. 10 mins each) performed as staged readings on Sunday Oct 26, starting at 2pm in the 3rd floor Studio at Alumnae Theatre. No reservations necessary, and admission is FREE, but donations are gratefully accepted. Drop on by! Only three more performances of Big Maggie: Thu – Sat of this week on the Main Stage of Alumnae Theatre. Closes Saturday March 8, then Alumnae Theatre Company’s New Ideas Festival begins March 12 in the Studio! 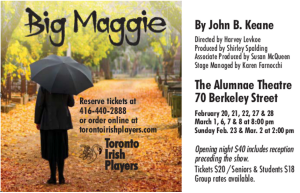 Saw another marvelous Toronto Irish Players (TIP) production yesterday afternoon – this time, John B. Keane’s Big Maggie, directed by Harvey Levkoe, on now at Alumnae Theatre. Big Maggie is set in 1960s rural Ireland, where recently widowed Maggie Polpin (Janice Hansen) is delighted at her newfound freedom from a philandering lout of a husband – and doesn’t care who knows it. Her four young adult children, each in various stages of grief, are disappointed when mum takes control of the family farm and general store, not receiving their expected share of the business – and are forced into choosing her way or the highway. For Maggie, her singular goal is to live free and secure, with no one to answer to or for but herself. And she is not above making some ruthless, calculated choices to get there.